Just been listen to some John Mayall on D4's blog, so I thought I'd put on one of my favourite blues tracks. 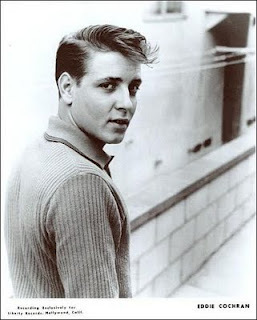 It's by rocker Eddie Cochran, Eddies Blues was recorded on 25th August 1959, but not released until 1964, 4 years after his death, on the My Way album. If you've not heard Cochran play the blues, then you may well be surprised. Oh man, butter. So easy to listen to that one, my approval goes your way, sir!